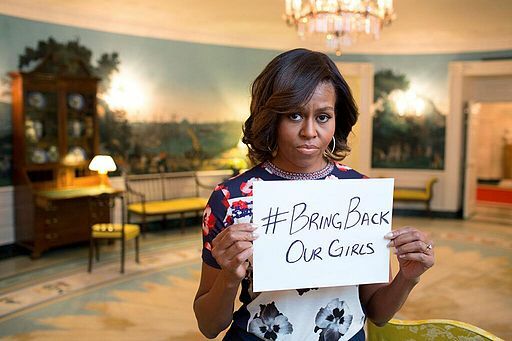 Michelle Obama supporting the campaign for the rescue of abducted Nigerian girls. Christchurch and Wellington will hold rallies next week in support of the #BringBackOurGirls campaign that is gaining momentum worldwide. Since the news broke of kidnapping of 276 Nigerian girls on 14 April, social media and international news outlets have rigorously campaigned for the return of the girls, making the hashtag #BringBackOurGirls trend worldwide. On Wednesday, 14 May 2014, New Zealand supporters of the young school girls, abducted in north eastern Nigeria, will be holding rallies in Wellington and Christchurch to ask Prime Minister John Key to add his voice to the call for the safe return of these girls to their parents. Wellington Mayor Celia Wade-Brown will address the walkers at Civic Square at 12.10pm and Minister David Shearer will address the walkers when they arrive at Parliament, says Jumoke Giwa, one of the organisers, who works with Change A Life Nigeria. Change-A-Life volunteers in Wellington and Christchurch are organising this rally in solidarity with the abducted girls and their families in Nigeria. “Our primary aim is to raise awareness about the plight of the abducted innocent girls and potentially get the Nigerian government to secure the release of these girls within the shortest time possible,” says Jumoke. Funmi Iyanda, the founder of Change-A-Life Nigeria, has cancelled her participation at the ongoing World Economic Forum in Abuja, Nigeria, as part of her stance to call for the safe return of these innocent girls. “My immediate concern is rallying support and generating interest to pressure the government into rescuing those girls, reassuring Nigerians, supporting the families and fighting Boko Haram,” says Funmi.